Thanks to the lovely Biolee Team, I get to try out the Biolee acnépris products. I’m going to review 3 basic skin care products in this post then followed by another 2 special care products in the next post. Before going on to the products, let me tell you a little about Biolee. Biolee is from Korea, therefore all products are Made in Korea. Biolee was conceived because of a father’s love for his daughter resulted in finding patented ingredient, pine pollen extract, and creating products to ease pains related to acne, physical and emotional. Biolee still strive to develop and produce products to do the same for its customers. Perfect for sensitive skin, this gentle cleanser is hypoallergenic yet effectively able to deeply cleanse away makeup, oil and dirt. The gentle foam glides perfectly onto your skin, softening and cleansing away bacteria to reveal a fresher and cleaner complexion without drying it out. I tried it both on my hand and face. Review: You can see from the pictures above, it can effectively remove oil from the skin. I love pine pollen fragrance which makes me enjoy washing my face. It’s not just a simple cleanser, its a purifying cleanser which takes out the remains of the makeup, sunscreens, dirt, oil, even trouble-causing factor. Double cleanse after using your makeup remover. Using natural pine pollen to control surface oil, this light weight and oil free toner, revitalizes and hydrates your skin, giving it a radiant glow. It is your necessary second step after cleansing to maintain the right PH balance and prevent irritation for your sensitive acne/oily skin. Use AM and PM. Review: Totally oil-free perfect for acne/oily skin. This cool and refreshing toner will calms and soothes my skin after applied. Besides, controlling oil, it also helps to hydrate my skin which is great for my dehydrated skin. After toner, we must put on Moisturizer then followed by the most important step: Sunscreen. Extremely light weight and non-comedogenic, this totally natural and paraben free UV protector effectively shields your skin from the harmful UV rays from the sun. The aloe- vera extract and hyaluronic acid makes this sunscreen not only a necessary shield from the sun but also a great skin care that hydrates. I tried it both on my hand and face as well. Review: Before using Biolee Oil-Free UV Protector, I’m using an aqua type of sunscreen for my face. Aqua type is very lightweight and non-oily which I love it a lot. But Biolee Oil-Free UV Protector proved me wrong, not all non-aqua type of sunscreen are oily. Biolee Oil-Free UV Protector surprisingly doesn’t gives off any greasy feeling even through its not in watery form. 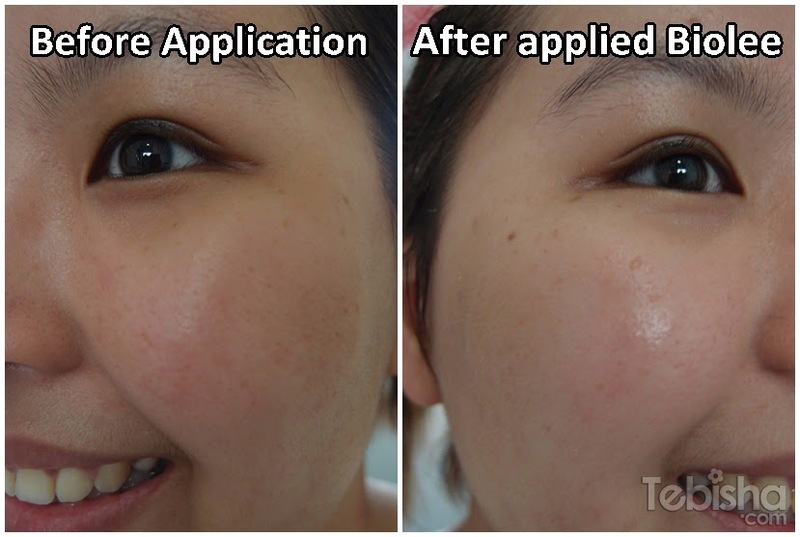 From the pictures above, you can see after applied it’s actually brighten up my skin, if you don’t intend to put on makeup on that day you can end off with Biolee Oil-Free UV Protector. You will still have perfect and radiant skin. Where to buy Biolee Products? I will continue the other 2 special care Biolee products in the next post.